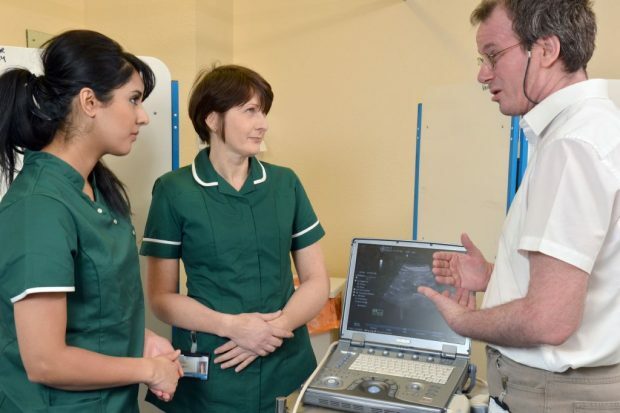 The role of the screening technician in measuring the diameter of the aorta is essential to the success of the NHS Abdominal Aortic Aneurysm (AAA) Screening Programme. AAA screening reduces the number of premature deaths among men aged 65 and over through early detection, effective monitoring and treatment. Screening can detect a dangerous swelling (aneurysm) in the aorta – the main blood vessel that runs from the heart, down through the abdomen to the rest of the body. Abdominal aortic aneurysms are most common in older men, which is why we only invite men for screening during the year they turn 65. Screening technicians measure the aorta using an ultrasound scan. Men whose aortas measure between 3.0 and 5.4 cm are invited back for regular surveillance scans while men whose aortas measure 5.5 cm or wider are referred to a surgeon. Guidance for the initial training and maintenance of competence among screening technicians is summarised in the scope of practice document that was updated in 2016. Sometimes it is not possible to clearly visualise a man’s aorta on ultrasound. Reasons can include high body mass index or excessive bowel gas. In these circumstances the man is usually offered another scan on a different date. If it is still not possible to measure the aorta at this second scan then the man should be referred to an appropriate medical imaging unit to be screened by a suitably qualified ultrasound professional. These men are still classed as being within the screening programme and the service they receive should be the same wherever they live in England. We have now updated the management of non-visualisation aortas guidance document to support local screening providers and imaging units. If you have any queries about the document please contact the PHE Screening helpdesk.